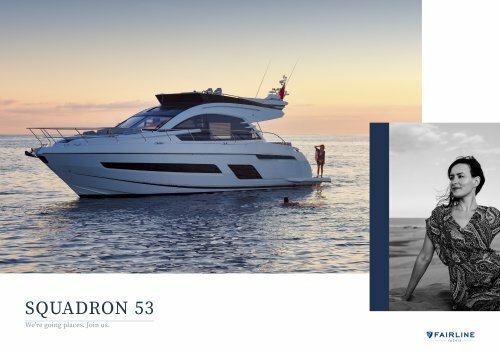 Introducing a new design standard Meet the beautiful SQUADRON 53 Every. Perfect. Detail. Twin helm Triple helm CE L E BRATI N G 50 YE A RS Flybridge This has to be one of our favourite spaces on the Squadron 53, with its uninterrupted 360˚ views and tremendous entertainment potential. Galley up, forward CE L E BRATI N G 50 YE A RS Main Deck – Galley Up We are also very happy to point out that the Squadron 53 is the first-ever Fairline yacht of its size to feature a cleverly designed seating area on the foredeck. As for inside, the galley can be located in one of two areas.